(London’s Daily Telegraph) – Hungary’s prime minister has called for the EU to round up illegal immigrants and deport them to guarded camps on an island or North Africa. Viktor Orban made the comments as he lashed out at German Chancellor Angela Merkel’s refugee policy allowing millions of refugees to flood Europe, saying it was unfair for Berlin to try to distribute migrants across EU member states. “This could be an island, it could be a coastal area in North Africa, but the security and supplies of that area must be guaranteed by the EU in its own interest,” Mr. Orban said in an interview published on Thursday, September 22. “Those who came illegally must be rounded up and shipped out,” he said. 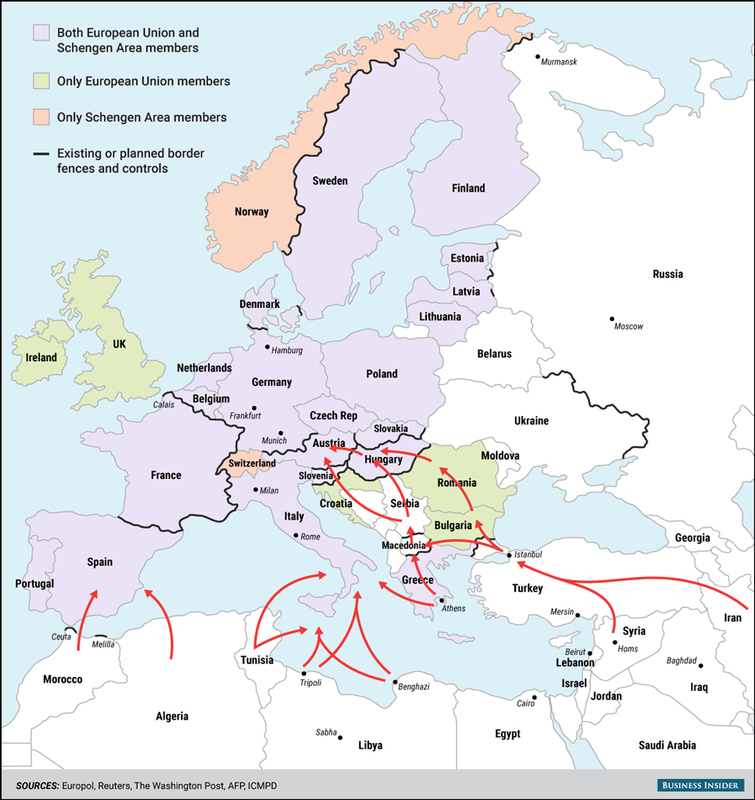 “We must set up large refugee camps outside the EU, with armed security and financial support provided by the Union. Everyone who came illegally must return there. There they can file for asylum,” he added. His government is sponsoring a referendum to be held on October 2 on whether Hungary should reject EU quotas to resettle migrants among member states. 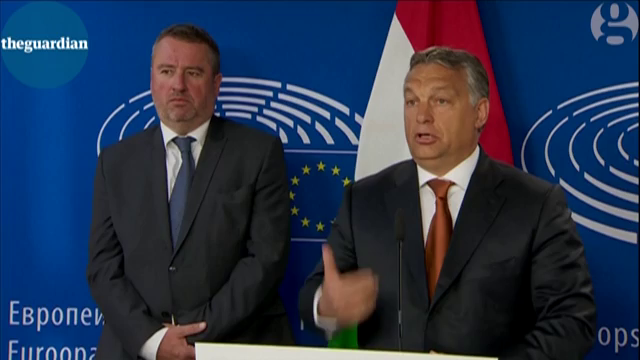 Hungarian media have reported that he may push for fundamental amendments to the Lisbon Treaty if a large majority of Hungarians back him in the referendum. On Wednesday, Nordic countries Denmark, Finland, Iceland, Norway and Sweden co-signed a letter expressing their “great concern” at Budapest’s refusal to act by the Dublin rules, under which refugees must seek asylum in the first EU country they enter. They called on the EU migration commissioner, to “take measures” promptly against Budapest’s violation of EU law. Earlier this month Jean Asselborn, Luxembourg’s foreign minister, said Hungary should be suspended from the European Union for violating democratic core values and treating refugees like “animals”. (Agence France-Presse) GENEVA — Swiss voters approved a new surveillance law on Sunday, in a victory for the government which argued the security services needed enhanced powers in an increasingly volatile world. The proposed law won 65.5 percent support across the wealthy alpine nation, final results showed. 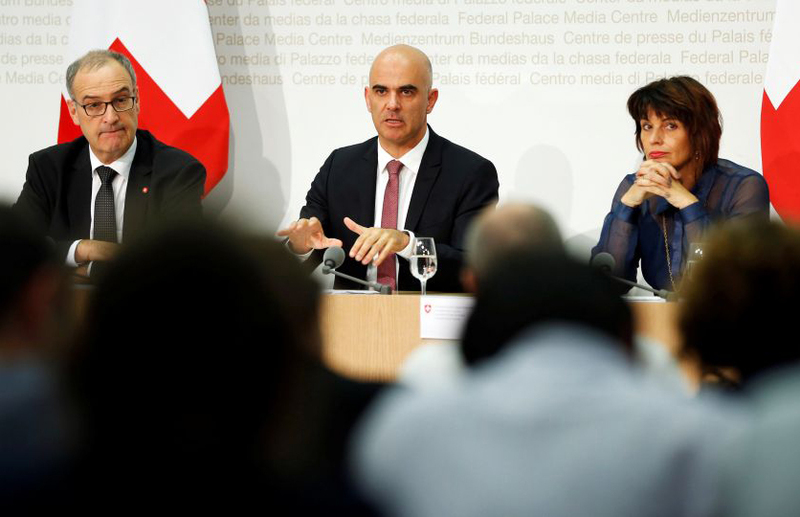 Swiss Defence Minister Guy Parmelin (L-R), Interior Minister Alain Berset and Energy Minister Doris Leuthard attend a news conference following the vote results in Bern September 25, 2016. 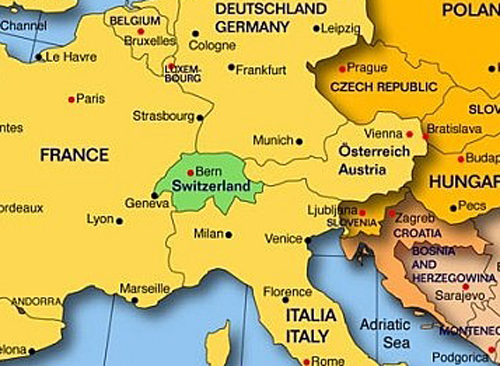 Switzerland’s police and intelligence agencies have had limited investigative tools compared to other developed countries: phone tapping and email surveillance were previously banned, regardless of the circumstances. But the new law will change that. The government insisted it was not aiming to set up a vast data-gathering apparatus…. “This is not generalized surveillance,” lawmaker and Christian Democratic Party vice president Yannick Buttet told public broadcaster RTS as results were coming in. “It’s letting the intelligence services do their job,” he added. Swiss defense minister Guy Parmelin…insisted the Swiss system was not comparable “to the United States or other major powers,” who have struggled to find the right balance between privacy and security. How it would work: Phone or electronic surveillance of a suspect will only be triggered with approval by a federal court, the defense ministry and the cabinet, according to the law. Bern [the Swiss government] has said these measures would be used only a dozen times a year, to monitor only the highest-priority suspects, especially those implicated in terrorism-related cases. The law was approved by parliament in 2015, but an alliance of opponents, including from the Socialist and Green parties, got enough signatures to force Sunday’s referendum. The poll was part of Switzerland’s direct democracy system, in which votes are held on a wide range of national issues four times a year, and even more frequently at regional and municipal levels. Just 43 percent of voters took part in Sunday’s poll, a slightly lower mark than recent referenda when flashpoint issues like immigration were on the ballot. Overshadowing the vote was a scandal dating back to 1989 and the dying days of the Cold War, when Swiss citizens learned that the security services had opened files on 900,000 individuals, detailing their political and trade union affiliations. The revelations sparked outrage in a country where people fiercely guard their privacy, and led to significant curbs on police intelligence measures. (Agence France-Presse) AMMAN — A prominent Jordanian writer was shot dead Sunday on the steps of a court where he was facing charges for sharing a cartoon on Facebook that was offensive to Muslims. 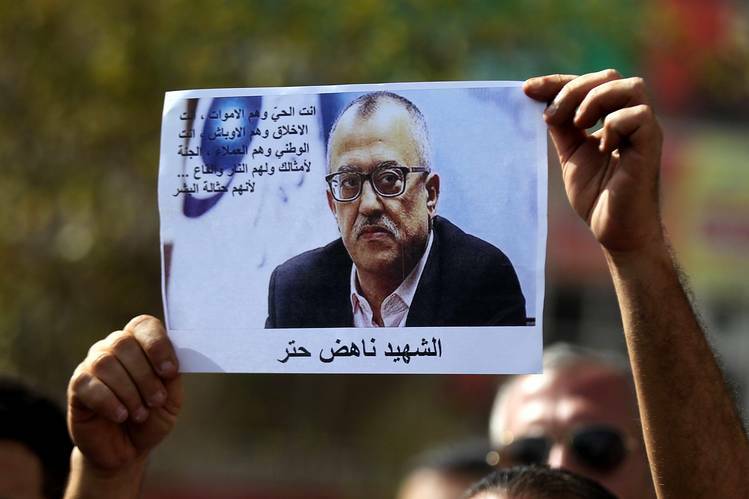 Nahed Hattar was struck by three bullets before the alleged assassin was arrested at the scene of the shooting in Amman’s central Abdali district. The assailant — bearded and dressed in a grey dishdasha worn by conservative Muslim men — shot Hattar, a 56-year-old Christian, as he made his way up the steps outside the court, a security source told AFP. Hit in the head, Hattar was pronounced dead on arrival at hospital, the source said. The gunman, a 49-year-old resident of the capital, gave himself up to police at the court, the source added. Media reports said he was a former preacher in an Amman mosque. A judicial source later said the assailant was remanded for 15 days and charged with premeditated murder, meaning he could face the death penalty if convicted. The suspect, an education ministry employee, had acted alone and was not linked to any “terrorist” group, a source close to his interrogation said, asking not to be named. Mohammad al-Jaghbir, Hattar’s friend, told AFP he had witnessed the killing. “We were climbing the steps when a bearded man… got a pistol out of a bag he was carrying and fired at Nahed Hattar,” he said. Hattar’s family said the writer had no protection despite having asked for it after receiving death threats on Facebook and by phone. Hattar was a political commentator known for his antipathy towards Islamists including Jordan’s Muslim Brotherhood and also his support for Syrian President Bashar al-Assad. Any depiction of God is prohibited in Islam. Hattar removed the cartoon after it triggered outrage on social media. He was arrested on August 13 and charged with inciting sectarian strife and insulting Islam, before being released on bail in early September. b) What percent of Hungarians support Prime Minister Orban’s handling of the migrant crisis in their country? Prime Minister Orban also said, ”Those arriving have been raised in another religion, and represent a radically different culture. Most of them are not Christians, but Muslims… This is an important question, because Europe and the European identity is rooted in Christianity. Do you think it is wrong to say that you want to protect the culture of your country? Explain your answer. “Those arriving have been raised in another religion, and represent a radically different culture. 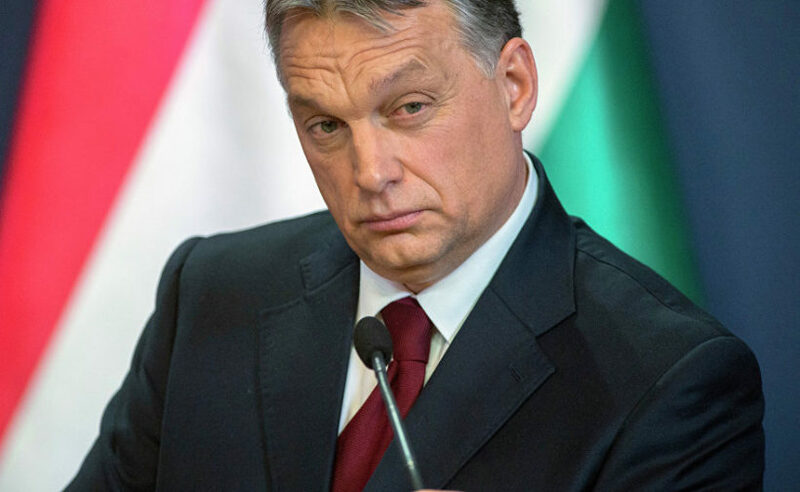 Most of them are not Christians, but Muslims… This is an important question, because Europe and the European identity is rooted in Christianity.” — Hungarian Prime Minister Viktor Orbán. The last chance to save Europe’s roots might well come from the former communist members of the EU — those who defeated the Ottomans in 1699 and now feel culturally threatened by their heirs. Do you agree with the assertions made by the writer? Why or why not? b) What percent of Swiss voters approved the law? c) How did Yannick Buttet defend the new law? d) Why did citizens have to vote on the law passed approved by parliament in 2015? Lawmaker Buttet argued that Switzerland’s handcuffed intelligence agencies had become too reliant on help from other nations because they were deprived of using the full range of modern investigative tools. b) Why was Mr. Hattar murdered? c) Read the “Background” below and watch the video under “Resources.” Why was Mr. Hattar facing charges in court? d) Are you surprised by the Prime Minister’s order? Explain your answer. Although he had removed the cartoon and explained he was not trying to offend Muslims but rather make fund of terrorists, Jordanian Prime Minister Hani al-Malki had ordered Interior Minister Salam Hammad to summon the writer and to initiate legal proceedings against him. On Sunday Hattar’s brother Majed, who accompanied him to his trial, blamed the government for his death. “We hold the prime minister, the minister of the interior and the security services responsible for Nahed’s killing,” Majed said. The government denounced the killing as “heinous” and said the law would be “firmly applied to the person who committed the crime”. The opposition Muslim Brotherhood and Dar al-Iftaa, the highest religious authority, also condemned the attack. 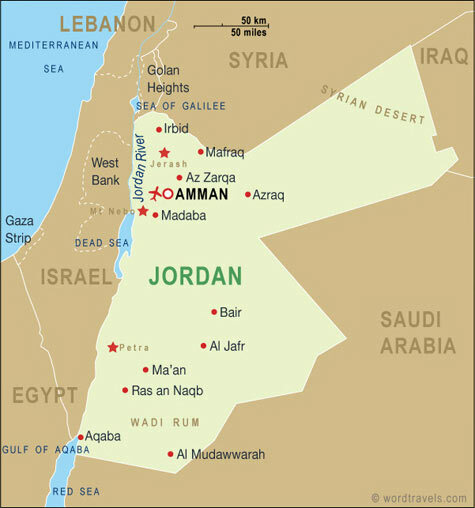 Jordan is a leading member of the US-led coalition fighting IS in neighbouring Iraq and Syria, and was targeted in a June 21 suicide bombing that killed seven border guards. The kingdom has carried out air strikes targeting IS jihadists and also hosts coalition troops on its territory. In recent years, extremists have attacked other publications for publishing caricatures seen as insulting to Islam, including in Europe.